Another wonderful collection of fabulous stories by amazing authors! I enjoy SO MUCH these extra stories put together by several authors whom I just LOVE! And I especially LOVE IT when one of them is kind of a BONUS story! As far as I can tell (I haven’t read everything Kathleen Fuller or Beth Wiseman has written…), Amy Clipston’s is the only story in this collection that fits that description but that’s enough for me! To be fair – I’m going to go in order. Down Syndrome has got to be one of the toughest subjects to write about and I applaud Beth Wiseman for, not only doing it, but doing it well! 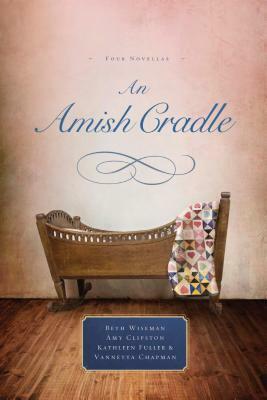 It’s always difficult to understand God’s will in these situations and I love how Beth shows us that – Amish or not – these parents have to deal with the situation as a mother and father. OK… I admit it. This is my favorite story in the book! And that’s really saying something because they’re all so fantastic! Carolyn and her husband Joshua are two of my favorite characters from Amy’s Hearts of the Lancaster Grand Hotel series. This is one of those stories that also shows how the plain folk deal with tough situations things in much the same way as we all do. Although it does come in handy that most Amish have a very strong faith! I hope to see many more stories like this! 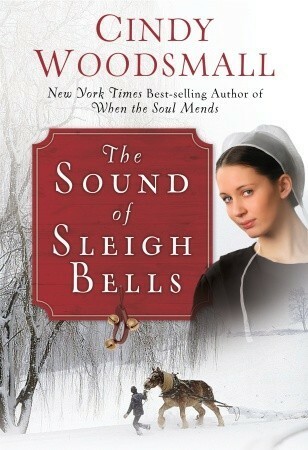 This is a free eBook/ Novella that Vannetta Chapman offers to go along with her Pebble Creek Amish series! It’s definitely worth reading, free or not! So don’t miss it! There is another freebie eBook/Novella that goes along with the series too: “Home to Pebble Creek” and you shouldn’t miss it either! 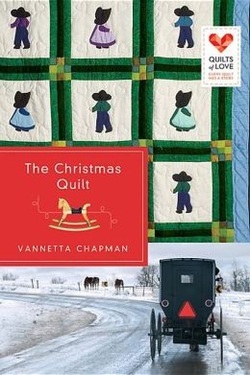 Another wonderful story from The Pebble Creek Amish Series by Vannetta Chapman. Fans of the series will enjoy this chance to briefly revisit Pebble Creek, and new readers will be introduced to an Amish community that is more deeply explored in the three full novels, A Promise for Miriam, A Home for Lydia, and A Wedding for Julia. As a bonus, this free eBook also includes Amish homestyle recipes for chicken and dumplings, green beans, and fresh bread. Heavy snow blankets the southwestern Wisconsin Amish community as nineteen-year-old Grace Miller closes the schoolhouse for Christmas break. She’s looking forward to having extra time to help the family prepare for the holiday, and she is hoping to get a few more drawings in of the beautiful, snowy Pebble Creek landscape. Her courtship with Adam Lapp is going on six months, and Grace can’t wait to give him his present: a blue-and-brown buggy blanket she crocheted for him. Yes, this Christmas is going to be especially joyful. 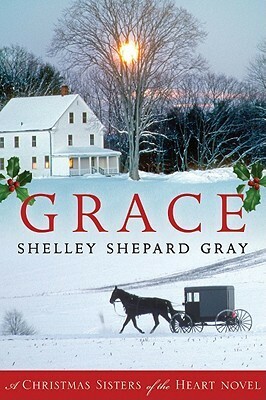 Yet, amid the cheer of snowshoe outings, church potlucks, and holiday festivities, Grace is given a bittersweet reminder of the Christmas story. Grief is present with celebration, and though the future is rarely certain, she is given a heartwarming glimpse that God knows our needs before we do and will provide. One of the things I have noticed about these books is how easy it is to overlook any negatives. The wonder and joy of the stories easily outweigh any grief or heartbreak we see. From the heartbreak that opens the first novel to the worry over loved ones that unfolds in each story to the losses we experience with and through the characters, these stories show us that the good in life is tempered with bad. I think at least a part of the reason for this is that we must have some bad to truly appreciate any good. If there was never a reason to worry about our loved ones, could we really appreciate them the way we need to? God, in his magnificence, knows this about us. He designed us this way and he has a reason. Sometimes his ways are hard to understand but they are the best way. It just isn’t always easy to see it in the beginning. Many times it is in retrospect that we see the beauty of God’s plans! I think Vannetta’s novels show this beautifully. She doesn’t dangle a character in front of us, letting us become attached to them and then yank them away. She makes them beloved in a different way, a normal way and then either shows us their loss and grief or shows us others grieving for them. To find this book on Amazon click HERE. And you can get “Home to Pebble Creek” on Amazon by clicking HERE. 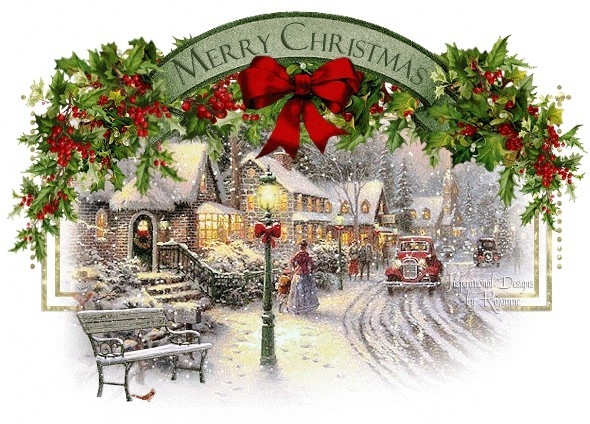 Wishing you and your family a Peaceful and Joyful Christmas season this year! Most of these I’ve read already but a few of them are on my to-read list. 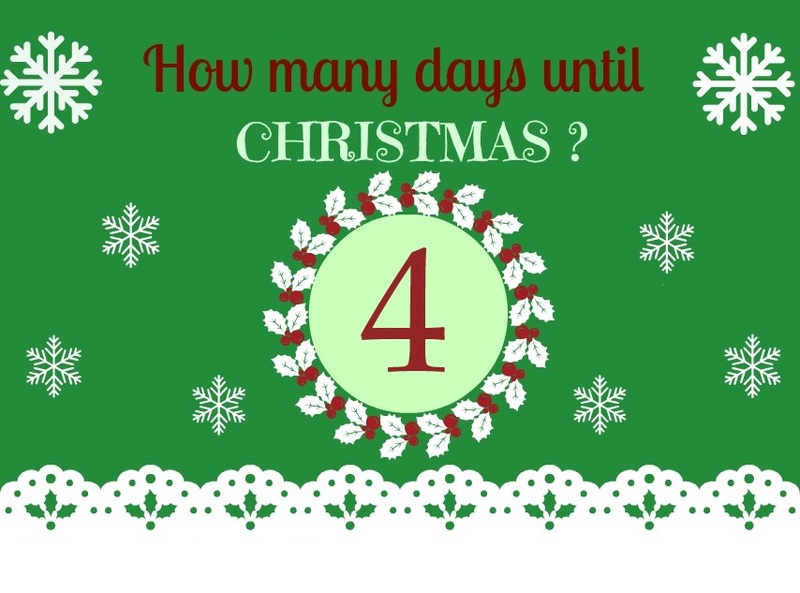 It’s going to be a great Christmas season! The organization is a little weird. I tried to group them by author and by sequence or time published. Hope that’s not too confusing. I do apologize for any confusion. I have edited this post and taken out some books I previously featured. So I’ve redone the entire post. They’re not in the same order but I think this could be even more fun! I’m a little disappointed to have to do this at Christmas time but a friend of mine recently reviewed one of the books I had featured and she discovered some very bad language so I have taken them out. I have a confession to make here. I only put in the books because I enjoyed the movies that were made from them so much. Unfortunately, it seems the books are nothing like the movies. I will never understand why people feel the need to include nasty language or inappropriate behavior in their stories. It does NOT make them better. And it certainly does not make them Christian. So here are my own personal favorites! From GoodReads: Annie Weaver always planned to return home, but the 20-year old RN has lived in Philadelphia for three years now. As her time of rumschpringe is about to come to an abrupt end, bringing for Annie an overwhelming sense of loneliness. She returns home and finds herself face-to-face with a budding romance with an Amish farmer and important choices to make. 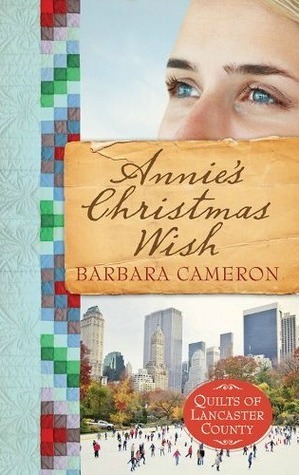 From GoodReads: Annie’s life is deliciously full as the Christmas season approaches. She helps her husband, Samuel, attend to the community’s minor medical needs. She occasionally assists Belinda, the local midwife, and most days, she finds herself delivering the buggy to her brother Adam. Annie s sister-in-law Leah is due to deliver their first child before Christmas morning, and Annie is determined to finish a crib quilt before the “boppli” arrives. With six weeks to go, she should have no problem . . . but God may have a different plan. 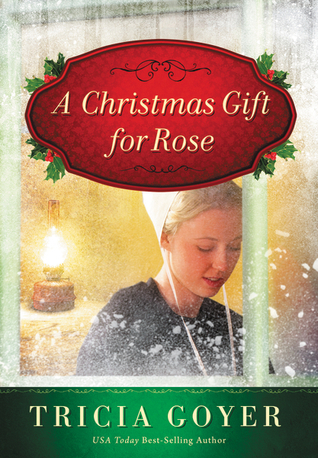 Leah is rushed to the English hospital when the infant arrives early, and Annie discovers the Christmas quilt may hold a far greater significance than she ever imagined. 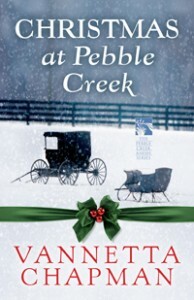 From Amazon: From The Pebble Creek Amish Series by Vannetta Chapman. Fans of the series will enjoy this chance to briefly revisit Pebble Creek, and new readers will be introduced to an Amish community that is more deeply explored in the three full novels, A Promise for Miriam, A Home for Lydia, and A Wedding for Julia. As a bonus, this free eBook also includes Amish home-style recipes for chicken and dumplings, green beans, and fresh bread. Heavy snow blankets the southwestern Wisconsin Amish community as nineteen-year-old Grace Miller closes the schoolhouse for Christmas break. She’s looking forward to having extra time to help the family prepare for the holiday, and she is hoping to get a few more drawings in of the beautiful, snowy Pebble Creek landscape. Her courtship with Adam Lapp is going on six months, and Grace can’t wait to give him his present: a blue-and-brown buggy blanket she crocheted for him. Yes, this Christmas is going to be especially joyful. Yet, amid the cheer of snowshoe outings, church potlucks, and holiday festivities, Grace is given a bittersweet reminder of the Christmas story. Grief is present with celebration, and though the future is rarely certain, she is given a heartwarming glimpse that God knows our needs before we do and will provide. 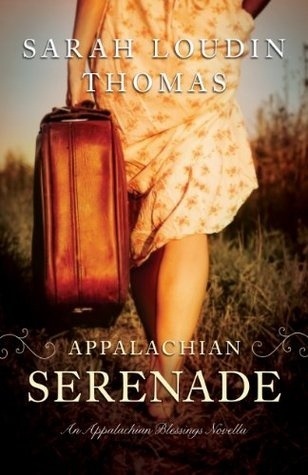 From GoodReads: Born in the midst of the hardships of The Great Depression, Rose grew up in Berlin, Ohio, in the arms of a loving Amish family. But as she prepares to marry, she’s thrown into confusion when she learns the truth of her birth. She was born Englisch and abandoned when the family moved on in search of work. Was she meant to be Amish or would she have been better off growing up with her own kind—Englischers? And was her intended’s gift of discovering her birth family given out of love or fear? and she’s only six and a half! Plus, her favorite librarian, Miss Donovan, seems sad. She won’t even fix up the rundown nativity in front of the library in time for Christmas. Then, an old woman is attacked outside the library, and, one by one, the nativity figures start to disappear! and he promises to find the missing nativity pieces for Katie. Now, all Katie has to do is pray that Ella’s delivery goes well and that some kind of nativity is in place for Christmas Eve. Oh, and that Miss D. falls in love with Connor. Katie knows from watching her three brothers that it makes people real happy. And that would be a Christmas miracle indeed! From GoodReads: Judith Graber has always been the obedient daughter. When her older brother Josh struggled with his love life, she offered wise counsel. When her younger brother Caleb flirted with the idea of leaving their order, she firmly told him he was wrong. Over the years, she’s watched her younger siblings, helped around the house, and worked in her family’s store during her spare time. Judith feels overworked, overlooked, and underappreciated this holiday season. But everything changes when her father hires Ben Knox. Ben Knox is the “bad boy” of Sugarcreek. Though he’s never considered jumping the fence, he’s certainly never tried to be anything close to dutiful. Two years ago he left Sugarcreek under a cloud of shame. Rumors circulated that his rumspringa had been filled with more than the usual harmless explorations. Now he’s back and working side by side with Judith. As the chaos of the holiday season threatens to sap all joy, sparks fly between Ben and Judith. But Judith steels herself to ignore her infatuation. The last thing she wants to be is just one more girl who falls under Ben’s spell. Ben, on the other hand, wants Judith to realize there’s more to him than his bad reputation. When he fled Sugarcreek, he was running from a disruptive home life. Now that he’s back, he wants a fresh beginning. 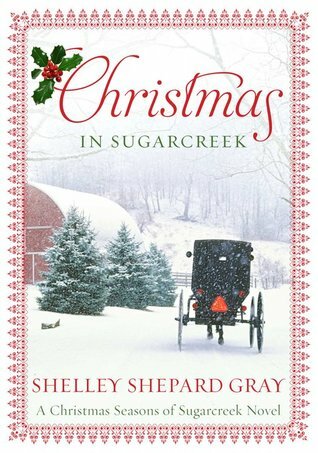 Could this Christmas season bring love and a new life for the unlikeliest pair in Sugarcreek? From GoodReads: It’s never too late to go home. It’s Christmastime at the Brenneman Bed and Breakfast, and everyone is excited about closing down for the holidays. But when two unexpected visitors appear seeking shelter, the family’s commitment to hospitality is tested. First Levi arrives, sullen and angry…but insisting on staying for five days. Next Melody shows up. She’s almost nine months pregnant, but won’t say a word about why she traveled all the way from Kentucky by herself. As the two strangers settle in, the Brennemans try to make the best of an uncomfortable situation, except for Katie, who knows a thing or two about keeping secrets. She is determined to learn the truth about these two strangers…all while keeping her own secret safely hidden away. All is revealed when a snowstorm traps them at the inn. From GoodReads: After a year of secrets and scandal, will this Amish community finally find peace under the bright promise of Christmas? Beth Byler has a secret. Ever since she met Englischer Chris Ellis while helping out at the Yellow Bird Inn, she can’t stop thinking about him. She knows a relationship could never go anywhere—Chris was working undercover in Crittenden County as a DEA agent. That meant he faced danger daily and carried a gun, making him completely unsuitable for an Amish woman like herself. But she knew he felt the attraction, too. It was the reason he left so suddenly, promising never to see her again. Then, three days before Christmas, while Beth is taking care of the inn, Chris returns. This time, he is bleeding and in need of a place to hide. Against her better judgment, Beth takes him in and tends to his wounds. She also promises to keep his presence a secret. Before long, it becomes clear that nothing between them has changed—a relationship is inevitable. But are they ready to sacrifice everything for this chance at love? 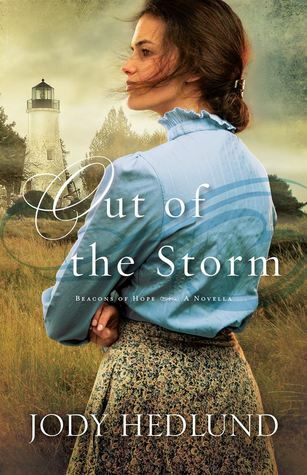 From GoodReads: Beth Hertzler works alongside her beloved Aunt Lizzy in their dry goods store, and serving as contact of sorts between Amish craftsmen and Englischers who want to sell the Plain people’s wares. But remorse and loneliness still echo in her heart everyday as she still wears the dark garb, indicating mourning of her fiancé. When she discovers a large, intricately carved scene of Amish children playing in the snow, something deep inside Beth’s soul responds and she wants to help the unknown artist find homes for his work–including Lizzy’s dry goods store. But she doesn’t know if her bishop will approve of the gorgeous carving or deem it idolatry. Lizzy sees the changes in her niece when Beth shows her the woodworking, and after Lizzy hunts down Jonah, the artist, she is all the more determined that Beth meets this man with the hands that create healing art. But it’s not that simple–will Lizzy’s elaborate plan to reintroduce her niece to love work? 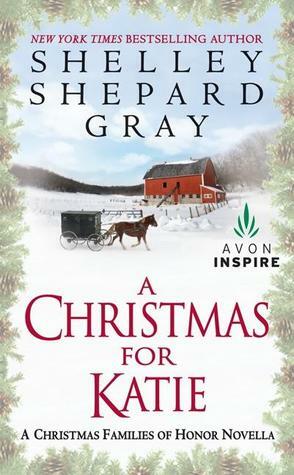 Will Jonah be able to offer Beth the sleigh ride she’s always dreamed of and a second chance at real love–or just more heartbreak? From GoodReads: Mattie thought her childhood sweetheart adored her until he abruptly ended their engagement on Christmas Eve. Three years later, will learning the truth behind his rejection restore her Christmas joy – or open the door to even deeper heartbreak? 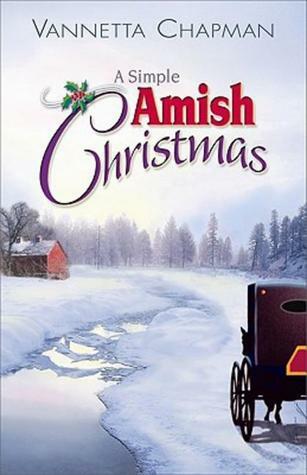 Spend Christmas with the Amish in this story of love, romance, heartache, and restoration. Experience the holidays with the Plain folk and discover the power of second chances in this touching story from the author of the New York Times bestseller, The Bridge of Peace. Gideon Beiler has loved Mattie Eash since they were children. But when faced with unexpected circumstances, he makes up an excuse to end their engagement. He doesn’t want to lie to her, but he believes that telling Mattie the truth will be more hurtful. Brokenhearted, Mattie moves from Apple Ridge, Pennsylvania to Ohio, where she pursues her longtime dream of becoming a cake decorator. She finds a new beau—a man offering the secure relationship Gideon has denied her. When Mattie is forced to return to Apple Ridge, she and Gideon must confront the suffering created by his dishonesty – and address the powerful emotions that continue to bind the two childhood friends. 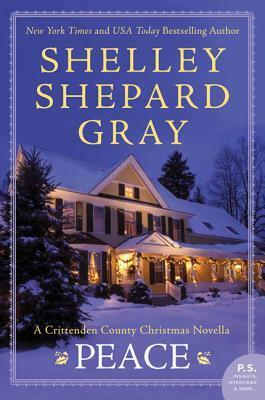 From GoodReads: This Christmas, experience learning to trust alongside the Plain folk of Apple Ridge, Pennsylvania in this heart-warming tale of second chances. 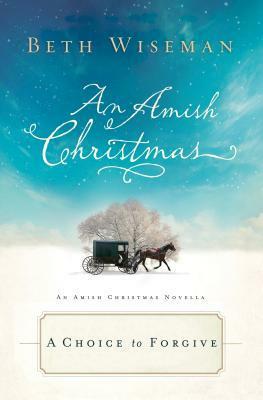 Sadie enjoys her freedom away from home and her mission trips to Peru, but after four years, her Old Order Amish family insists it’s time to come home and settle down. Levi, a bachelor who distrusts women after a family heartbreak, also has no desire for romance. To keep their families from meddling in their lives, Sadie and Levi devise a plan—but soon discover that the walls around their hearts are breaking down. Can they let go of their prejudices, learn to trust each other, and embrace a future together? From GoodReads: Philip Gulley takes us to Harmony, Indiana, at Christmastime as inspiration strikes the inimitable Dale Hinshaw. Always looking for a way to increase the church’s profit margins, Hinshaw brainstorms a progressive nativity scene that will involve the whole town, complete with a map like those for the Hollywood stars. Neither Pastor Sam Gardner nor the other members of the Harmony Friends meeting express any enthusiasm for this idea, but Dale is unstoppable. Meanwhile, Pastor Sam has his own concerns: he’s having his annual argument with his wife, and he’s worried that the four-slotted toaster he bought for her may be too lavish a gift. Amidst the bustle of the season, the citizens of Harmony experience the simple joys and sometime loneliness that often go unseen. 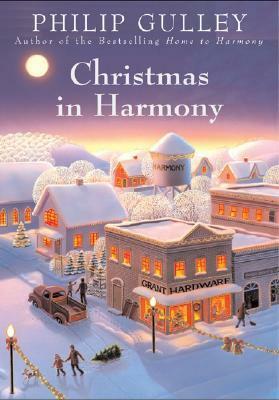 From GoodReads: It’s autumn in Harmony, and Pastor Sam Gardner has vowed to be ready for Christmas. 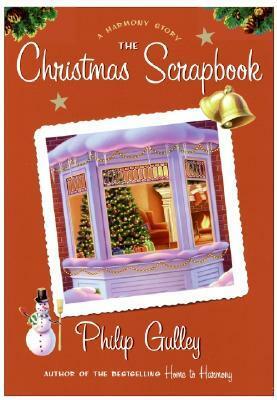 Determined to redeem a dreadful history of gift giving, Sam enrolls in a scrapbooking class to make a Christmas gift his wife will never forget. However, Sam’s absence from their home every Wednesday night, coupled with his fishy alibi of attending a men’s group, raises her suspicions. Meanwhile, Sam struggles in the class and must attempt to complete his project with only the help of his faithful secretary, Frank. As Christmas fast approaches and rumors of Sam’s Wednesday night absences swirl along with the snow, a series of mishaps leads to a Christmas no one will soon forget. From GoodReads: The ADVENTure of Christmas is a guide for moms concerned that their children are losing sight of Jesus in the midst of the distractions the holiday season brings. Lisa Whelchel was such a mom, but instead of abandoning the traditions of Christmas she rediscovered their original meanings, which were intended to remind people of God’s unfathomable gift. Hanging lights on the house, wrapping gifts, and decorating the tree have become opportunities to teach her children about how they relate to Jesus’ birth. With The ADVENTure of Christmas, mothers can redeem what’s been lost from the very symbols that are gentle reminders of the true meaning of Christmas. Have you discovered that Jesus sometimes gets lost in the middle of the hustle and bustle of His birthday party? Would you like to be able to keep your children’s focus on Jesus and also join them in the wonder of the celebration? 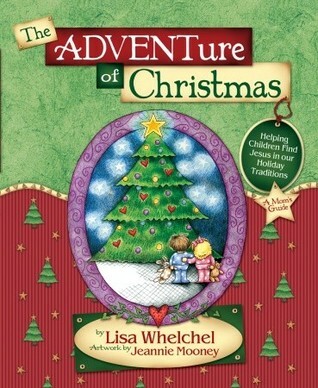 For each of the twenty-four days preceding Christmas, The ADVENTure of Christmas serves as a fun and handy guide that describes the significance behind your favorite traditions. Hanging lights on the house, wrapping gifts, and decorating the tree will become opportunities to share how these customs relate to Jesus’ birth. The ADVENTure of Christmas recaptures the true meaning of this beloved season, giving reasons to celebrate for years to come. Feeling like Jesus had gotten lost in the frenzy of the holiday season, I asked the Lord to show me what I could do to teach my children the true meaning of Christmas. I was caught off-guard when He simply replied, “Don’t do anything differently. Look in the middle of the celebration and you will find Me.” He was right. There was no need to orchestrate moments to pontificate about “the commercialization of Christmas.” Instead, Jesus is beckoning us to come to the party and bring the kids. In doing so, we run into Him at the mall, the movies, even at school. He hides in the lights, the carols, and the cards. He is there when we dress the evergreen tree, when Dad dresses up in a red suit, and even when we eat turkey and dressing! When Anna Stolis takes over for her aunt, the local midwife, Christmas night heats up with multiple deliveries, three strangers’ quilts, and unexpected help from the handsome and brooding Asa Lapp. After Daniel disappeared that long-ago Christmas Eve, Lydia built a life with his brother. But now she’s a widow and Daniel has reappeared, asking for forgiveness. Can she go back to her normal life with her long-lost love as her neighbor? Seth is no longer the arrogant young man who shattered Miriam’s confidence and broker her heart. Will he be able to show “plain” Miriam that she is truly beautiful to him? 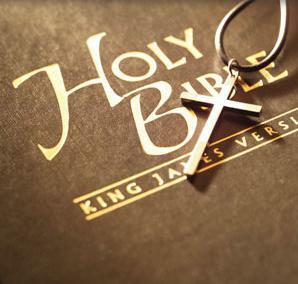 The birth of one child forever changed the world two thousand years ago. On a snowy Christmas night in Lancaster County, another child changes the world for two very different couples. From GoodReads: Jaime and C. J. Fitzpatrick began their married life as most couples do–in love and looking forward to a bright future together. But four years later they’ve drifted apart and are almost ready to call it quits. Mattie Riehl was hoping to give her husband Sol the Christmas gift they have both longed for–news that a baby was on the way. But as usual, she is disappointed. The holidays bring an acute awareness to Mattie that her dream of a big family isn’t likely to become a reality. Then a winter storm raging outside blows the Fitzpatricks into the Riehl home–and into a much slower pace of life. Can these two couples from different worlds help each other understand the true meaning of love this Christmas? 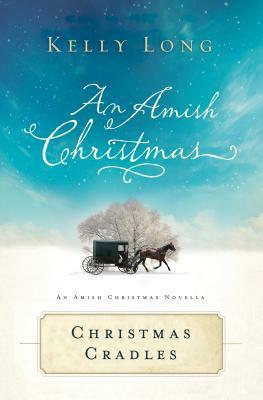 From GoodReads: From the bestselling author of A Widow’s Hope and Never Far from Home comes a brand-new Amish novella that will add joy to the Christmas season. Sarah Beachy has plenty to be joyous about as autumn leaves start to fall. She loves her job at the English bed-and-breakfast where she cooks and refreshes rooms between guests. She has a serious beau, and everyone expects an engagement soon. Why, then, would she jeopardize everything by suddenly deciding to take a trip to Cleveland to track down a brother who left the Order years ago? 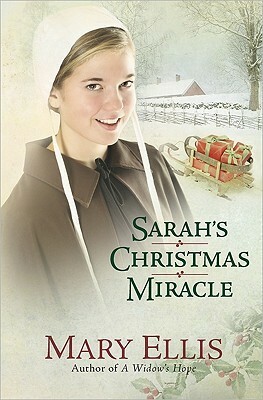 Her family’s faith in God is put to the test as the holiest night of the year approaches and Sarah remains far away. Sarah’s mother, Elizabeth, has been missing her son for such a long time…will she lose her daughter to the English world as well? Or will the Beachy family receive an unexpected Christmas miracle? From GoodReads: Take a trip to Bird-in-Hand, Pennsylvania, where you’ll meet the women of the Kauffman Amish Bakery in Lancaster County. As each woman’s story unfolds, you will share in her heartaches, trials, joys, dreams … and secrets. You’ll discover how the simplicity of the Amish lifestyle can clash with the ‘English’ way of life—and the decisions and consequences that follow. Most importantly, you will be encouraged by the hope and faith of these women, and the importance they place on their families. Amy Clipston artfully paints a panorama of simple lives full of complex relationships, and she carefully explores cultural differences and human similarities, with inspirational results. 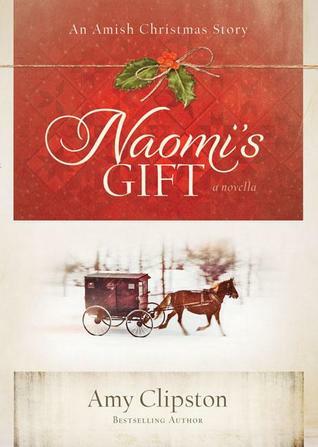 Naomi’s Gift includes all the details of Amish life that Clipston’s fans enjoy, while delivering the compelling stories and strong characters that continue to draw legions of new readers. 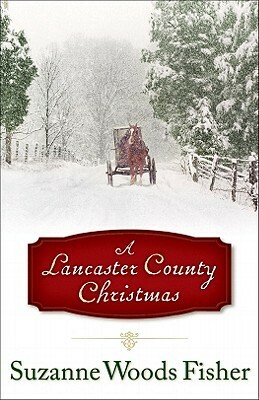 From GoodReads: In the tradition of her widely popular Kauffman Amish Bakery series, author Amy Clipston tells the tale of Anna Mae McDonough who was shunned by her family four years ago when she left her Amish community in Lancaster County, PA, to marry an -Englisher- (non Amish) man and move with him to Baltimore. 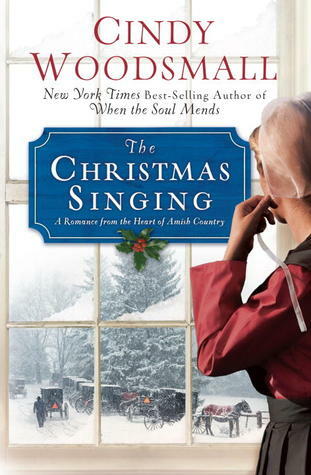 Now, eight months pregnant when her first child, she longs to return home for Christmas to reconcile with her family, especially her stern father, who is the religious leader for her former Amish church district. So Anne Mae writes a letter to Kathryn Beiler, her brother-s wife, to enlist her help. Kathryn asks her husband, David, if she should arrange Anna Mae-s visit. David cautions her that a visit would cause too much stress in the family and instead suggests they visit Anna Mae and her husband in the spring. However, Kathryn arranges the visit anyway, believing in her heart that it-s God-s will for the family to heal. 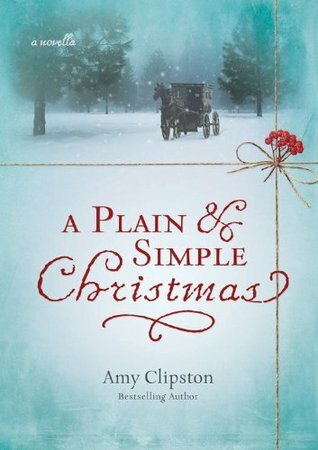 When Anna Mae arrives in Lancaster for Christmas, she doesn’t receive the welcome she expects and her world begins to fall apart, leaving her to question her place in her family – and her faith in God. A book filled with love, the pain of being separated from one-s family, and the determination to follow God-s will regardless of the outcome, A Plain and Simple Christmas is an inspiring page-turner that will keep you guessing what happens next-right to the very last page. From GoodReads: Ever since her step-mom brought her a snow globe of the New York City skyline, Annie has wanted to visit the beautiful, big city. Since it’s nearing the time of Annie’s rumschpringe — the time when Amish youth experience Englisch life to make a decision whether to live in that world or become baptized into the Amish faith—the family decides a visit is a good idea. They watch the Macy’s Christmas parade, admire the decorated store windows, skate at the Rockefeller Center rink and — Annie’s favorite — get a glimpse of a writer’s life while visiting the New York Times building. But others aren’t as thrilled with Annie’s lure to the Big Apple. Aaron has long been attracted to Annie and is sure he’s in love. As he watches her engage in big city life, he grows concerned that she won’t want to return to their quieter life. 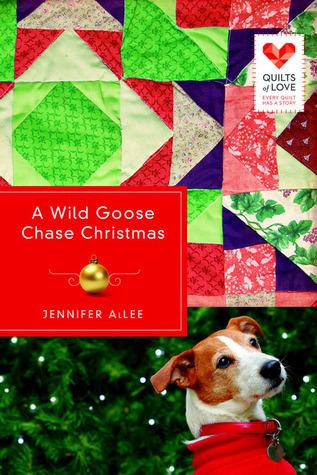 From GoodReads: Upon her grandmother’s death, Izzy Fontaine finds herself in possession of a Wild Goose Chase pattern quilt that supposedly leads to a great treasure. Of course, once the rest of the family finds out about the “treasure map,” they’re determined to have a go at the treasure themselves. And, if that weren’t enough, Max Logan, a local museum curator, contacts Izzy and says that Grandma Isabella promised him the quilt. What is it about this quilt that makes everyone want it? Is Izzy on a wild goose chase of her own, or a journey that will lead her to the treasure her grandmother intended? And of course… We cannot forget the most important Christmas book, the one that started it all, the original book of Christmas. 1 And it came to pass in those days, that there went out a decree from Caesar Augustus, that all the world should be taxed. 2 (And this taxing was first made when Cyrenius was governor of Syria.) 3 And all went to be taxed, every one into his own city. 4 And Joseph also went up from Galilee, out of the city of Nazareth, into Judaea, unto the city of David, which is called Bethlehem; (because he was of the house and lineage of David:) 5 To be taxed with Mary his espoused wife, being great with child. 6 And so it was, that, while they were there, the days were accomplished that she should be delivered. 7 And she brought forth her firstborn son, and wrapped him in swaddling clothes, and laid him in a manger; because there was no room for them in the inn.